WATERLOO – Autobiographical artifacts produced as part of an intergenerational pilot project between Wilfrid Laurier University’s English department and the Grand River Council on Aging (GRCOA) are featured in one of THEMUSEUM’s current exhibits. Titled The Aging Dialogues: Sharing Wisdom, Preserving Our Legacies, the collection, which focuses on human connections and creativity that spans generations, will be on display at the Kitchener cultural site until May 23. As a complement to the exhibit, THEMUSEUM will present a community talk on Sunday, April 10. In the fall of 2015 Michael Ackerman, a professor at Laurier’s Brantford campus, used Laurier’s partnership with the GRCOA to develop a community component to an existing course on early American autobiography. Fourteen local seniors were paired with 14 Laurier students in order to explore and document aspects of their own life stories. The results – diverse in form and content – include formal autobiographies, photo albums, travel journals and more. 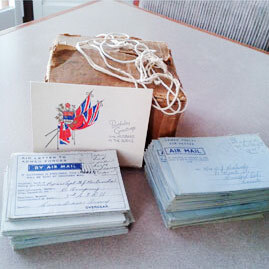 One group of seniors chose to curate their life stories using a series of “autobiographical artifacts.” Objects in these collections were varied: a box with 200 letters exchanged between newlyweds who were separated by the onset of the Second World War; an invitation to tea from Princess Diana; sports memorabilia from two decades of coaching; and even a prosthetic arm. These artifacts act as anchors for memories, and represent defining events in the individuals’ personal narratives. A panel presentation, titled “Intersecting Dialogues: conversations, contested stories and the crafting of a narrative self,” will be hosted by Ackerman on Sunday, April 10 at 1:30 p.m. The discussion will engage the students and seniors who were involved in the class, and will feature different projects from those featured in the general exhibit.